The concentrate of acid in refrigeration oil is expressed as an acid number in mg of KOH per gram of oil (milligrams of potassium hydroxide per gram of oil). The acid number is a measure of the amount of hydroxide solution needed to neutralize the acid in the oil. The more acid there is in the oil, the more potassium hydroxide is needed to neutralize it and, so, the higher the acid number. In the Phase III test, an acid number of 0.05 mg KOH per gram of oil has been set as the maximum acceptable acid concentration in mineral oil and alkylbenzene oil. In polyol esters, the number is generally accepted as 0.16 mg. 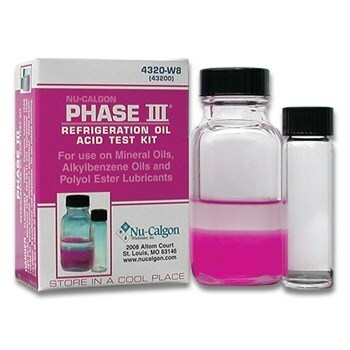 Mineral and alkylbenzene oils with an acid number less than 0.05 mg or POE's with an acid number less than 0.16 mg are acceptable and will cause no change in the color of the test kit's acid indicator. However, if the respective oils have an acid number greater than these limits, it will cause the acid indicator to change from purple to pink or clear indicating that the oil is contaminated.